Simplest budgeting technique EVER. 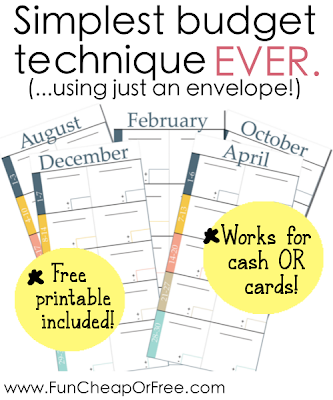 Includes FREE printables! When we first cracked down on budgeting, I tried everything. Nothing was working long-term, so I wised up and created my own system. Break my budget down weekly. Have only THREE budgets that encompass all our regular spending (grocery, other, and family…more on that below). Click below to watch the video on Youtube, or click HERE to watch it online. See the updated video HERE! 1. Open 7 bank accounts. Yes, seven. This will help you organize and simplify your money more than you can imagine. Read and watch a video all about that HERE. No reason to step on each others' toes! Divide and conquer! Sit down and write out everything you spend money on, then divide up. If you do the cooking, you should buy the groceries. If you drive the kids around usually, you should be in charge of paying school fees. If you are the one that knows about cars, you should be the one to handle oil changes and car repairs. This will keep you efficient, organized, and give you autonomy to do things your own way! See more about that HERE. Anything you could find at a neighborhood grocery store. We're not talking Costco or super Walmart. We're talking a “neighborhood Walmart”, Smiths, Safeway-type stores. They don't have power drills and sheets for your bed, but they have most of the basic items you might need to buy on a day to day basis. Food, shampoo, dog food, lotion, baby wipes/diapers, shaving cream, ziplock baggies, basic kitchen utensils & baking items, cleaning supplies, milk, basic cold remedy medicine, makeup and other toiletries, etc. Money set aside for normal, regular, non-grocery expenses. These are “want to have” items most of the time, and not “need to have” items. Once again, this does NOT include any form of bill or utility, see the next category for that. See below for more explanation. Home decor needs, clothing, haircuts, babysitting money, piano lessons, getting the car cleaned, school pictures, lunch with friends, spa treatments, shoe repair, gifts for birthdays/showers, etc. So where do bills, utilities, and gasoline come from? In our house, money for that comes from our family budget. Expected, set monthly expenses involving the family, house, and travel, as well as unexpected expenses involving the family. These are the “need to have” expenses that keeps the family running, and are NOT food-related. Utilities (gas, electric, cable, internet), medical expenses (co-pays, medical bills, insurance), car expenses (gas, repairs, new tires, registering the car, oil changes), home costs (mortgage payment, homeowners insurance, home repairs, new water heater, new furniture, TV, or other large household expenses, etc. ), family entertainment (travel, trips), etc. See below (the bank accounts section) for how we separate all these budgets out. 4. Decide how big those budgets should be. Pull out your detailed statements from the last 3 months that show every dime you've spent (spreadsheet, credit card statement, or whatever you use to track your spending). Total up how much you spent on “other” in the first month, then second, then third. Average them out (add the sum of the 3 months then divide by 3). …now…cut it in half 🙂 If half seems to harsh, cut it down and start there. Make it hurt a little, it's almost guaranteed you are spending more than you should because, well, that's human nature! 5. Track your new budgets. As explained in the video, an envelope is the single most effective way I’ve ever tried. Here’s a quick review of the video. You can make your own envelope like I did in the video, or you can download our free envelope printables HERE. Remember…The point is that you stay WITHIN your weekly budget. However, life happens. So if you happen to go over budget, remember…NO BORROWING BELOW THE LINE! Feel free to borrow side-to-side. 5. Use leftover money wisely. The point is to try to stay below budget each week. If it's the end of the week and you have money left in your budget try not to look for a way to spend it. Rather, put it toward any debt, or if you’re debt-free other than a house or car, put it in your SLUSH FUND or savings accounts. If you prefer a more “techy” approach to tracking, you're like my husband. He would rather shave his eyelids than carry around an envelope. He uses Mint.com to track his responsibilities because it's digital, has a fabulous free app, and connects with every loan, bank account, credit/debit card we have, and he can also set and track financial goals. I recommend doing both because Mint is more comprehensive…but it didn't work for me in terms of keeping track of day to day spending. If you have a long month (one with 5 weeks), you can either make the first or last week of the month longer to include the extra days, or simply divide your budget by 5 and keep all your weeks as 7-day weeks. Just do what works best for you. In our free printables we divided everything by 4 weeks to keep it uniform and simple. Try cutting your budget down a little to begin with. You probably spend money that you don't need to be spending on little things, that could really serve your family a lot better if you put it in your slush fund and put it toward BIG, long-term things. Keep EVERY receipt for the month in your envelope, so if you lose track or need to return something you have everything right there. If you bring home extra money in a month(bonus, extra commissions, extra paycheck that month, etc.) DON'T alter your budget! There is absolutely no need! Put the extra money toward debt, put it in your savings, or put it in your slush fund. Don't go out and buy more groceries with it, that is noooooo fun. Be wise with every dollar you bring in. You need to get creative with how you spend money on groceries. 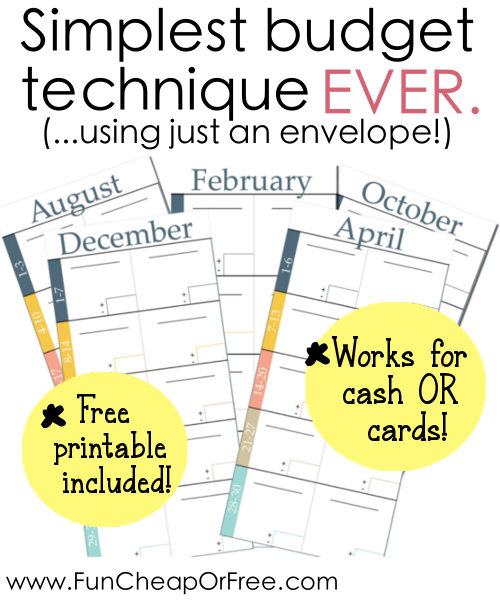 Click HERE for a full tutorial on how I save 1/2 every month without clipping a single coupon. Additionally, click HERE for lots of cheap meal ideas, how to not waste food, and more. Open 7 bank accounts. “Whaaaaat?! Hold the phone! Put on the breaks! Sound the alarm!…SEVEN accounts? Giiirl, yo' mus be ca-RAY-zay!” Ok, maybe I am. But I will promise you something: by opening multiple accounts, it WILL make your life easier. Watch the video below, or click HERE to watch it online, and click HERE for all the details, how-to, why's, and info. Once again, click HERE to download our free printables. Ps Did you like this post? If so please subscribe to my newsletter so you don't miss another one! I am your new follower and addicted to your site. and congrats for your cheapskate appearance. I like your new website outlook. I have a question about budgeting. Our local walmart does not price match on produce except stater brothers and ralphs. So I totally go to 4 stores – smart n final and costco one week and the following week would be walmart and indian store. Our smart n final carries produce very cheap and walmart produce prices are very high compare to s &f. We do not eat meat so I can easily buy groceries in $600. My typical credit card bill is $600 – $800.grrrrr. depands. So I want to be more accountable and no more impulse buy. I do not need $150 for my walmart and indian store trip so how should I balance out since you say do not cross weekly. and my costco and smart and final trip cost me roughly $200. we do not eat outside may be once a week and mostly fast food. does your grocery budget includes eating out and family fun like chucky cheese trip, yogurtland trip etc. thanks. Hello Dina! Good question. I’m not sure if I understand your situation at 100%, but this is what I would tell you…it doesn’t matter where you shop. You could go to 50 stores per week for all I care! You can shop anywhere you want, you just can’t go over your weekly budget. No matter where you go, you just can’t spend more than your weekly amount. The beauty of this system is that it allows you the freedom to buy whatever you want, and shop wherever you want…but when your budget is gone, it’s gone. So naturally I would suggest shopping the best deals so that you can stretch that weekly budget all the farther. Hope that helps! Hello, I just stumbled across your site from Pinterest. I am hooked! Thank you for all your wonderful information. My husband and I are going to be starting your system this week. Again, thank you and keep up the great work! I have a question about having 7 accounts… I think it’s a great idea and I want to go ahead and open the accounts but how do you avoid monthly fees if you only have a small amount in each account every month? My bank requires $1,500 in the account or direct deposit in order to avoid paying $12/month. I was also curious how you go about using your credit card for everything. Do you pay off your credit card balance weekly, bi-weekly, monthly? I love your site by the way and can’t wait to try this out!! Thanks for the great advice! I know this is from a few years ago, but maybe this tip can help others. There are many online banks that don’t charge for a savings account and/or have a very low min balance to keep it open. Some may even give you money to open them. The key is that they’re all online. So if you’re ok with purely mobile banking, you should be good to go. (It’s ok to have a savings account with a dif. bank than you have your savings account. It should allow transfers between accounts easily.) Bonus: Online accounts give much better interest rates than brick and mortar banks! Ok, so this has been hard averaging the three months since we were just shopping for Christmas and birthdays. I decided to take what we spent on Christmas and divide it by 12 to figure out the monthly average. So when I divided that number in half I only have $360 for everything including eating out and I have a family of five, three little ones like you, and it is my husband’s birthday this month. I know it is supposed to be a challenge, but with 5 weeks, I might need to do a spending freeze two weeks out of the month to make this work. We do have venison for meat and a bag of meatballs and chicken in the freezer. What do you think? Should I up the amount or leave it? I love the envelope technique & definitely want to try it. However I’m confused with the Grocery/Other/Fam idea. If you only give yourself $600 total per month on the grocery & other – where do you account for the fixed expenses like rent, utilities etc? Are you saying you spend $600 in addition to Family budget? Sorry if that isa a dumb question 🙂 Thank you for all the helpful info!! Not a dumb question! Look under the “family budget” section. Those are hard to budget for but still need to be accounted for. So yes, that $600 for grocery/other is SEPARATE from the “family budget”. The point is that grocery/other are your expenses that you have control over and can budget for. Gas, electric, and even gasoline – you can’t really do that. While you should always cut back where you can on utilities and bills, separate it from grocery and other so you can really hone in and cut back on the things that you have 100% control over. I don’t know if I just missed this…but I was wondering if you touched on debt repayment on here? I think I have our family budget figured out along with the seven bank accounts, but I’m struggling with how to pay down our debt as fast as possible. My husband and I both have student debt and if we were to just pay the minimum payment each month, it would take us much longer than we would like. Would it make sense for a family with debt like ours to not have a slush fund and instead, anything extra goes toward debt? Also, I’m struggling with one other thing…we have varying payments for our bills…some are to be paid bi-weekly, some monthly, and one is even bi-monthly. The issue here is that means we have some months with two pays and three mortgage payments, and some months with three pays and two mortgage payments…it varies so much that I wonder if a monthly budget will work for us? Our situation is so much like Jenna’s, Jordan. How do we pay down debt as fast as possible?! We have student loan debt & medical bills, from when we didn’t have medical insurance. Are we not allowed to have a slush fund until all this is paid off?? I have also tried planning by budget monthly, but quickly became overwhelmed with the idea. Your system of tracking expenses weekly really is genius! I have one question: I was very interested in how you manage your money with seven bank accounts. When I clicked the link toward the top of this page, it took me to an error page. I was wondering if you could explain this method, as I have been searching to employ a similar system. I have never been so excited to start a budget! This is ingenious!! Thank you sooo much for sharing! Ooops forgot to say I am from Western Australia! Thank you for your help. I will have to check if supermarkets price match here. Stores usually require to see the special from another store before they give you the specials but as for supermarkets it is pretty much unheard of here. There are not that many different stores here anyway the competition is very low and the fact that we are so far away from the rest of australia makes the price of food pretty high. No hurt in asking though! I am very uncomfortable with carrying cash around. I feel that if my purse is stolen and I have cash, I won’t get that money back, but if most of my money is on my debit card (I have no credit cards), I have a good chance of recovering that money. I have had trouble with people stealing cash from me before, so this method, while extremely efficient, will probably not work for me. What do you suggest? Here are some posts to help! I like your site and ideas, and I’m also a member of DA (Debtors Anonymous), and many of the principals and ideas you have on your website sound very familiar…especially the one promoting the idea of saving (i.e. taking care of oneself and one’s needs) before paying off debt is especially familiar. Members of DA have found that deprivation only leads to more debting. The concept of using envelopes and things like that to “budget” (though we refer to it as a Spending Plan…which certainly applies to your suggestion of adding up your expenses for three months and then dividing them BY three, to determine how much you have spent and will need, etc.) is also very familiar. I wanted to let you know this, and to share this with your readers if I may, so that they may find the rooms of DA, if they are struggling with debting, overspending, or even Under-earning. Wow, Liz thank you SO MUCH for sharing!! I had no idea Debtors Anonymous even existed, what a great resource! Thank you so much for a fresh way of looking at budgeting. I live in England and its not as cheap to shop here. You are the first person to budget for groceries including toiletries and other essentials – this is the way that I think too! I’m hoping that following your plan will be like a breath of fresh air for my family. Keep up the great work. I am looking forward to joining in with your 2014 project too. Thanks so much for reading, especially from across the pond!! 🙂 XOXO! i was looking at this and love it! Just confused on the wife and husband account..
if i am a single parent should i double it so it is 200 per person for groceries etc? If you’re a single parent then still give each person $100 each per month. However if it’s just two of you (you and one child) $300, $75 per week, is reasonable. Hope that helps! I have watched your videos on the 7 accounts. My question is do you have to start your monthly budget with that total amount in order to keep adding to it? I have tried doing budgets in the past and they really never worked out for me. I’m a stay at home mom for right now and am trying to do what we can so that I can stay home with our daughter that has special needs. I am wondering about your Costco trip. You say grocery money is for your local grocery store. I currently spent 200 a week for 4 people. That is what I budget for groceries, that includes my regular grocery store trip and my Costco trip. I would love to shave 75 off of that but not sure how to do that and still shop at Costco. Where do you fit Costco into your budget. Hey there I love your budgeting technique totally changed everything for us. I love your envelope budget sheets however am currently trying to set us up and plan for 2015 and cannot change the dates on the pages. Are you planning on sending out an updated version of those?? Wow, you’re right…we’re almost to 2015! I need to get on that for sure. Yes, I will get some updated envelopes, stay tuned! 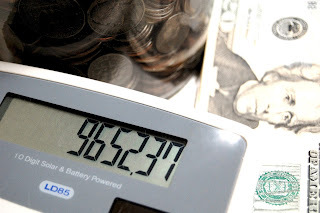 My husband and I had tried many budgets over the last couple years and I always fell behind because of tracking the receipts…would over spend and we never had any money to build up an emergency fund, etc. We have been working with your system for most of this year and we both usually end up with messed up husband/wife accounts BUT I realized this week when 4 of us went to the dentist that we could pay the bill without batting an eye!!!! This system eliminates us screwing up the household budget.!!!!!! We may forget to write down our receipts but all it does is take away our spending money. I can’t thank you enough and can’t wait to see the 2015 envelopes! Since leaving my job to be a stay-at-home mom, money has definitely gotten tighter. I’m interested in using the envelope system to manage our finances, but have a question regarding “extra” money. You say that any extra money each week should be put into a family slush fund, which is great! Other finance gurus suggest using cash for budgeting; then, extra cash is deposited into the slush account. How does the “extra money” work with the credit/debit card system? Great question! Yes, absolutely. In fact, it works better. With cash often times if you see a few dollars left over you’ll be more likely to spend it on small things like a Starbucks run, or an impulse-buy. It’s the way our brain works. With a card system you don’t really “see” the money. So you see what’s leftover in your account at the end of the month and it’s just a number; not tangible dollars. It doesn’t excite your brain like cash does, so you’re less likely to spend it, and it’s one click to send it on over to the slush fund! Just keep a running balance, a nice round number, in your family checking (like $1000 for example) so you know exactly what is extra. So if $1032 is in your checking at the end of the month, you know $32 is extra and can transfer to the slush fund! (or debt first, if you have it, then to savings if you don’t have a good cushion in your savings). Go to http://funcheaporfree.com/2014/01/the-7-bank-accounts-your-family-should-have/ for more info. I’m trying to find the 2015 envelope printables. When I click on the link it goes to 2013-2014. If you have new ons, could I receive them/a download link too? This sounds amazing and I’d love to try! Not the ‘official’ ones, but very usable I presume. Yes! Lindsay is the one who designed them for us in the first place, thanks for sharing! Hi Jordan, I’m just beginning your budgeting tips and have high hopes it’s going to help my family! Wondering how you set your family entertainment budget? Great article! I couldn’t help but to notice all the similarities to the Eyre’s family finance system! Any chance you might be one of them? 😉 Anyway, great job putting this together! I am determined to start off 2016 better organized in all areas of my life, and my financial area/budgeting is certainly one that needs to get it together! Thanks again! Brillant! Do you have 2016 envlopes yet? Interesting way of handling the family money – thank you for sharing. I’m not sure where you got your $100/person/month figure – perhaps that was true at the time that you made the video. The USDA has a cost of food chart that is updated every month. I find this helpful in figuring out how much we should be spending at our house. So good! I’ve always budgeted with an extensive spreadsheet but have lost track of keeping it updated as our family grows. I’ve been using Mint on and off for the past year but need something simpler. One question, how do you recommend budgeting for those Family bills that aren’t consistent each month or you don’t pay each month? For example, we pay our auto insurance twice a year or our garbage is billed every other month or the electric bill fluctuates depending on time of year. Do you just go through your bills each month and edit the budget or just average? Hi! Just stumbled upon your website and going to give this budget a try starting this month. So my question is, do you pay off your credit card’s full balance each month? So, if you are spending $600, do you pay that amount off your card? Thanks! Hey Jordan! I love your envelope system, I have printed out the envelopes from your web site for at least 3 years now. I’m sure someone has mentioned it, but just in case, there are 2 Decembers, and no November. I can appreciate that as a mother of 5 little ones and running your household and business that it’s easy to have this happen. By no means is this a criticism, only wanted to point it out. All the best to you and thank you again! Thank you! Will correct that right away!! Hi Jordan! I’m getting so much out of this post and others you’ve done on how to make a budget and stick to it so thank you!!! I did have a quick question, which I’m sure you’ve been asked a million times before and I didn’t read all of the comments so I hope I’m not repeating something you’ve already answered above buuuut, let’s say there’s an outfit that you want to buy that is over your $50 budget for the week (I’m just using this as an example – I’m not that much of a clothing gal but when I do buy something, it’s usually something that I feel is going to stand the test of time and therefore, might be over $50), does that mean that you save for it and wait until you have enough in the family savings or do you have a separate clothing budget for the month in your family checking? Or what if there’s a decorating item – a new bedspread for instance – do you have a home decor budget in your family checking? For me, I’m not going to buy these things every month so I don’t know where (and in what bucket) they belong. Thanks in advance! Hi and thank you for the free envelope printable, I am excited to start using it. When I print out the current month (August 2017) it keeps cutting off the end. I selected envelope on my print dialogue and fit to page, everything looks good except for the very bottom – any tips? Hello There!! The envelopes are updated, but one month still says 2017. Haha oops! Just corrected. Sorry about that! This template and whole system has been really helpful for me. Thank you! I tried this method when I first discovered it and tweaked it a bit to make it work better for me. I use an envelope to store receipts but I keep the budget portion written down in a notebook. It’s less likely that I will loose the notebook and I have certainly lost an envelope a time or two. It has worked great for me and I was pleasantly surprised how much I am able to afford with our weekly grocery budget, including items to stock our pantry and deep freezer. We were totally that family who ate steak on week one and ramen on week four because we didn’t have a budget in the past! My husband and I have been doing this, and it’s making our financial life so much easier! Thank you, thank you, thank you! I can’t even begin to tell you how much this system has changed my life!!!! I have been using this system for the last 3 months and we have saved so much money and it is keep us accountable for the money that we do spend! Thank you! Thank you! Thank you! You are seriously amazing!! I tried the “traditional” envelope system and totally failed. It was NOT for me. Your budgeting tips are perfect for families and moms and just make so much more sense! Can I be you when I grow up please? I’ve been binge watching your youtube channel the last couple of days and I still feel like I have no idea where to start or what to do. Do you just apply the 70% method no matter what the currency? Hi Jordan, great budgeting system! The Family Budget link goes to an error page. Any chance you can provide the correct link? Many thanks for all the great videos and posts! It has been updated! Thank you for pointing that out. Awesome!!! I’m so excited to start this in a fresh new January 2019! Thanks for sharing this with everyone Jordan. You are awesome. I’m so glad you meantioned using credit cards and mint.com because my husband is an engineer and totally would rather go digital but I just can’t keep track like that so using the envelope with a weekly budget would be much better for me. I have a question on that. How does Bubba track a lunch that he is eatting out if you have the envelope with the grocery and other money tracking records? How do you know what he is using? Love this system and ideas thank you for sharing! I was wondering if there was a 2019 version of the cash envelope printables?